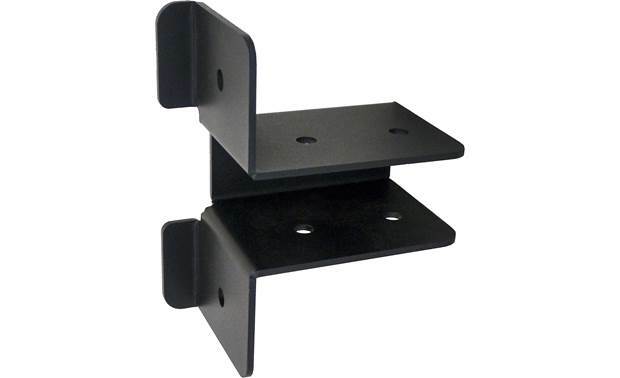 The sturdy SB24 brackets give you placement options for recess-mounting your MantelMount TV mount. The brackets let you attach a 2x4 support beam between two wall studs. You can then rest your MantelMount directly on the support beam for a clean recessed installation. The brackets are designed so you can install all the mounting screws through the recess opening. 2x4 Stud Bracket Kit: The SB24 Bracket Kit makes it easier to install horizontal pieces of 2x4 bracing inside the wall for recessed installations of the MantelMount MM340, MM540, MM700, MM750, and MM850 (all sold separately). When wall studs are far apart, when a center stud needs to be cut, or when the cleanest look is desired, sections of horizontal 2x4 can be installed through the recessed cutout of the MantelMount using the SB24 Bracket Kit. These 2x4 sections along with the SB24 Bracket Kit provide a solid structure for the recessed mount without the need for additional accessories, like metal horizontal braces. The MantelMount's recess frame can be attached with lag bolts through the holes in the front flange of each bracket of the SB24 Bracket Kit. Included Hardware: Each bracket of the SB24 Bracket Kit can be attached with the included lag bolts and washers. Always pre-drill the holes first. The attachment holes in each of the four brackets of the SB24 Bracket Kit can be reached for drilling and screwing simply be reach through an opening that is cut for a recess frame. When cutting a center stud, measure 1.5" above and below the template mark before the opening is cut out. The drywall will hold the stud in place while it is cut. Plunge cut through the stud at both locations so that these cut ends can be attached to the cross bracing when they are installed. This will ensure that the drywall remains intact to create the opening. If a bracket is near the cutout opening, make sure to orient the attaching hardware away from the opening so they do not interfere with a recessed frame. This hardware should be attached before the braces are installed into the wall.